16 Health Benefits of Rosemary | Eat This! Rosemary is a Mediterranean herb with needle-like leaves and pink, blue, or purple flowers. The word “rosemary” comes from the Latin words ros (meaning “dew”) and marinus (meaning “sea”). It is used in many culinary dishes and is commonly used to flavor soups, sauces, and meats. In addition to being used in cooking, it has also been used as a natural remedy for a variety of ailments over the centuries. Studies have found that our ancestors weren’t wrong in using it medicinally. I think you’ll be amazed as we were to find out just how many benefits rosemary has. Here are 16 health benefits of rosemary that’ll make you want to use it on a regular basis. Rosemary contains carnosol which has been found in studies to be a potent anti-cancer compound. Researchers have had promising results in studies of its efficacy against breast cancer, prostate cancer, colon cancer, leukemia, and skin cancer. In one study, researchers gave powdered rosemary to rats for two weeks and found that it reduced the binding of the carcinogen given to the rats by 76% and significantly inhibited the formation of breast tumors. Rosemary has long been believed to have memory-enhancing properties. In 1529, an herbal book recommended taking rosemary for “weakness of the brain.” Today, research has found that rosemary contains a diterpine called carnosic acid that has neuroprotective properties that researchers believe may protect against Alzheimer’s disease as well as the normal memory loss that happens with aging. Remarkably, even the smell of rosemary has been found to improve memory. Test subjects in cubicles were given essential oil of rosemary to smell and they had better quality of memory and better overall memory than the control group, though their speed of memory was slower compared to the control group. The same study that found that smelling rosemary improved test subjects’ quality of memory also found that their mood was significantly improved compared to the control group. Rosemary has been a popular natural migraine remedy for centuries. Boil some rosemary in a large pot of water and pour it into a bowl. Place a towel over your head and lean over the pot to inhale the steam for about 10 minutes. Because smelling rosemary has been found to improve memory and mood, this method may also help with memory function and put you in a better state of mind. It not only helps relieve the pain of migraines, but essential oil of rosemary can also be applied topically as a natural treatment for arthritis, sore muscles, and other joint and muscle pains. Rosemary contains two potent anti-inflammatories, carnosic acid and carnosol. One study found that these two compounds inhibited COX-2, an enzyme that causes pain and inflammation in the body. They also inhibited the production of excess nitric oxide, which also plays a role in the inflammatory process. Rosemary boosts the immune system thanks to its antioxidant, anti-inflammatory, and anti-carcinogenic properties. Because it is healing in so many ways, it boosts the overall health of the body. Studies have found that rosemary has powerful antibacterial properties against H. pylori (the bacteria that causes stomach ulcers) and Staph infections. Rosemary is often used to help treat digestive problems such as upset stomach, constipation, indigestion, and almost any other digestive related problem. It also helps to prevent foodborne illnesses when ingested with foods such as meat or eggs. There is a possibility that rosemary may stimulate hair growth. One study found that people with alopecia, a disorder that causes the hair to fall out, had significant hair regrowth after rubbing rosemary, lavender, thyme, and cedarwood into their scalps for seven months. However, it is not clear whether it was the rosemary or the other herbs that caused the regrowth. Essential oil of rosemary is often applied topically as a natural remedy for poor circulation, though there have been no studies to prove this effect. Rosemary can be used as a natural mouthwash and is said to work very well. To make the mouthwash, steep fresh rosemary in a pint of heated water. Strain it and use it as a mouth rinse as often as you like. It will keep in the fridge if covered. Rosemary is a mild diuretic, which means that it can help get rid of bloating and water retention in the body. When rosemary is used regularly, it may help in the increase of urine flow and help the kidneys function at optimal levels to help get rid of excess water in the body. Rosemary is a great natural remedy for respiratory problems. Breathing in the scent of the essential oil may help with congestion due to colds, allergies, respiratory infections, and the flu. You may also boil fresh rosemary in a pot of water, place it in a bowl, and breathe in the steam to help clear the lungs and throat. This will also help with any sinus or head pain associated with respiratory conditions. Rosemary has been used to treat liver problems for hundreds of years. Hippocrates prescribed it for this purpose. One study found that rosemary extract reduces cirrhosis in rats given thioacetamide, a toxic compound that is toxic to the liver. It also prevented liver damage from tetrachloride in rats and mice. Rosemary is a popular ingredient in anti-aging skin creams because it helps reduce puffiness, stimulates cell regeneration, increases firmness, and improves overall skin tone. It is a natural anti-inflammatory and increases blood flow to the skin. 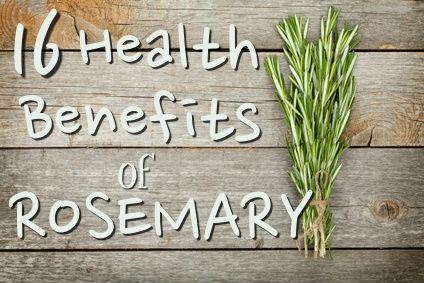 For the most part, rosemary is considered safe with no side effects. However, pregnant women should avoid consuming large amounts of rosemary because it may lead to uterine contractions and miscarriage. People with high blood pressure should not take rosemary because it may raise blood pressure. 3 Comments on "16 Health Benefits of Rosemary"
Makes a wonderful tea for sleeplessness stress related. Rosemary is considered to be possibly unsafe during pregnancy because it may have uterine stimulating properties. Pregnant women should avoid it or talk to their doctors before taking it or using it in cooking.